On March 14, 1548 the same Father Stefano Spataro baptized the daughter of Vincenzo Salamone. She was named Vincenza. Her godfathers are Mastro Vito d’Amato and Giovanni Simone Bonafede. Her godmother is Domenica la Laurificia. San Nicola Bari Archives, Codex A: p. 120 versus, entry d.
The synagogue which served the Jewish Community of Termini Imerese until late 1492 stood in the area now occupied by the Santa Chiara Monastery whose cloisters are visible in the photograph below. 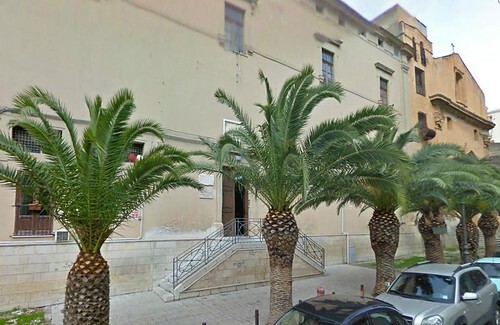 The Santa Chiara Monastery in Termini Imerese occupies the land upon which once stood La Moschetta, the town synagogue. After the expulsion of the Jews of Termini (which took two years to accomplish), Pope Alexander VI, (who drew the famous Papal Line of Demarcation) was asked by Padre Giacomo DeLeo to transform the abandoned synagogue in Termini into a church. Known as la Moschetta, i.e the Little Mosque, the synagogue was eventually to be incorporated into the Monastery of Santa Chiara and its adjoining Church of San Marco. The remains of the marble slabs comprising the floor of la Moschetta were discovered during the 1800s when the cloisters in the Santa Chiara Monastery were being excavated. Facade of the Monastery of Santa Chiara: remnants of the synagogue known as La Moschetta were uncovered when the cloisters were excavated during the 1800s. With a privilege from the Spanish Viceroy of Sicily, Don Fernandino De Accugna, and dated April 28, 1492, the authorization was given to construct a new synagogue within the city of Termini behind the Church of San Antonio da Padua. But it was never built because, just a few months after permission was granted, the Expulsion Decree from King Ferdinand dashed all plans. 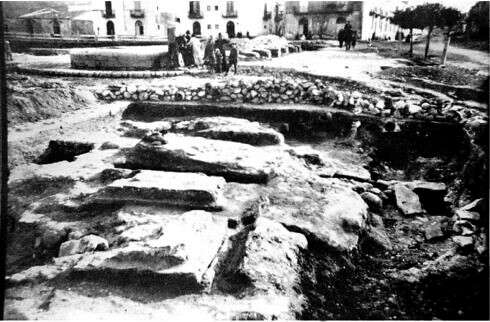 However, during work to re-contour the land around the church, which was carried out during the early years of the 20th Century, a Jewish cemetery was uncovered in the plaza immediately across from the Church of San Antonio da Padua. Jews first came to the island of Sicily from the Levant when the lands surrounding the Mediterranean Sea were part of the Roman Empire. During that time Greek Orthodox Christianity prevailed. In time the island passed to the Ostrogoths, Arian Christians who were very tolerant of the Jews. After the Byzantine reconquest of Sicily in 552, conditions worsened dramatically for the Jews of Sicily. Under Byzantine rule few Jews continued to live in Sicily because of official persecution. 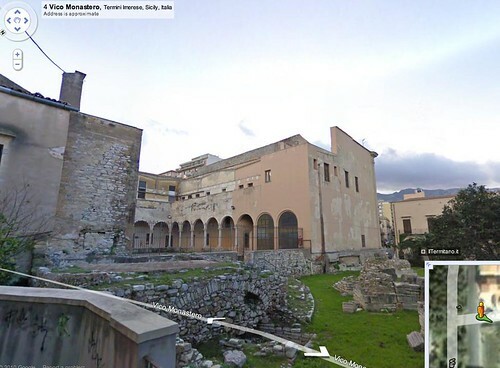 Sometime before 606 the bishop of Palermo actually ordered the synagogue there to be converted into a church. The final straw came in 722 with an edict issued by the Eastern Roman Emperor Leo III the Isaurian ordering the baptism by force of all Jews residing in the Byzantine Empire, which included Sicily. After the Muslim conquest of Sicily in 831-902, Jews settled once again on the island, this time in considerable numbers. In 972, the Arab merchant Ibn Hawqal mentioned a Jewish Quarter in Palermo, and by 1170, Benjamin of Tudela reported 1500 Jewish households in Palermo and 200 in Messina. In 1149, King Roger II forcibly brought the Jewish brocade, damask, and silk weavers of Thebes (in the Eastern Roman Empire) to Sicily with the objective of establishing a silk industry on the island kingdom. In both Poland and in Sicily, the nobility preferred to live in the cities rather than out on their agricultural estates in the countryside. To this purpose, in Poland the vast estates of the Magnates (Upper Szlachta) were leased from them almost exclusively by Jewish families whose head was known by the term Schenker (Arendar). Concurrently, in Sicily the operations of the great estates of the Barons were overseen by managers known as Gabelloti, and, as far as is known, they were Catholic Sicilians. As for urban Jewish families in Poland, these were forever locked in combat business-wise with the German Burghers whose forbears actually founded the cities of Poland. The source of the conflict had to do with fact that the Jewish merchants had an advantage over the Burghers: because of their international connections, Jewish merchants could make available the necessary commodities needed by town folk for considerably less than what was being charged by the Burghers. In 15th-century Termini Imerese there was no division at all among its merchants: as the notarial records show, Jews and Catholic Sicilians even went in on business ventures together. And several Jews in Termini had considerable real-estate holdings both in town and in the surrounding countryside. Before it was demolished in 1492, the synagogue of the Jewish Community of Termini Imerese stood in the area now occupied by the San Dighiera Monastery. In 1492, as part of an attempt to maintain Catholic orthodoxy and purify their kingdom of Moorish influence, the Iberian monarchs Ferdinand of Aragon and Isabella of Castile ordered the forced expulsion or conversion of all Jews in their lands, which included Sicily, on pain of death. In Sicily, the date of the expulsion was extended from September 18, 1492 to January 12, 1493, in order to allow the extortion of opportunist tax levies. One can only imagine the chaos suffered by Termini with the loss of so many Jews who were integral to the maintenance of services and distribution of necessary commodities. Witnesses recounted the sight of the Jews of Palermo waving from the departing ships to their former neighbors as they were borne away. Many Sicilian Jews fled to neighboring Calabria where the Spanish Inquisition caught up with them again fifty years later. Not all of the Sicilian Jews departed. A considerable number of Sicily’s Jews converted to Catholicism and remained on the island. In Sicily, such converts are referred to as Neofiti (Neophytes) or, as they were known in Portugal when a similar situation presented itself to the Jewish people there, New Catholics. As fate would have it, the Jews who had left Sicily for the Kingdom of Naples where King Ferrante held no animus against them, were, upon the timely death of this friendly monarch, forced to convert to Catholicism by the French. The converted Jews who survived the ensuing plague in the Kingdom of Naples, returned to Sicily. Note that the letter ‘x’ in Sicilian is pronounced ‘sh’. Therefore Muxa (Moses) is almost pronounced in the same manner as the Yiddish term for Moses: Moyshe. The Gisia, collected by Iosep Binna during the 1st half of the 15th Century, was a toleration/protection tax (extortion) levied on the Jews of Termini Imerese in order that they could freely practice their religion in a city which was predominately Catholic and theoretically hostile to the Jews, especially during Easter Week. It was paid directly to the Crown of Aragon which ruled the Kingdom of Sicily. In fact, in some European lands, the ruling powers considered the Jews living there to be the actual property of the king! The Gisia [Arabic: djizia] originated during the Muslim Era which preceded the establishment of Roman Catholicism as the principal religion of Sicily, in which case it was paid by Jews and Greek Orthodox Christians alike to the Muslim rulers of the kingdom. Catholicism was first established as the state religion of the Kingdom of Sicily during the 1200s when the island was ruled by the House of Hohenstaufen. Greek Orthodox Christians were exempt from paying the Gisia to the Catholic emperor, but the Jews were not. In 1224 AD, Holy Roman Emperor Friedrich II (whose mother, Constance, daughter of Roger II, was Queen of Sicily), responding to religious uprisings in Sicily, expelled all Muslims from the island, transferring many to the town of Lucera on the Italian Peninsula over the next two decades. According to some estimates, Frederick II deported around twenty-five thousand Muslims to Lucera in the 1220s to 1240s; these deportees made up only one-tenth of the quarter of a million Muslims subjected to Roman Catholic rule when the Normans seized power in 1091. Frederick II Hohenstaufen began to expel the Muslims of Sicily from the island kingdom in 1224. He is pictured here with Sultan Al-Kamil Muhammad al-Malik, ruler of North Africa. Some 268 years later, the Jews of Sicily would meet a similar fate under Ferdinand of Aragon. Jewish laws regarding the dead are very specific: unlike Catholics, hundreds of whom were interred under churches in the city, Jews had to be buried away from the inhabitants of any settlement, preferably outside the city walls. The church of Santa Caterina del Egitto (late 1300′s): Dedicated to a patron saint of female slaves, this late 14th-century church replaced an earlier edifice dedicated to Saint Catherine which had been built over a Jewish Cemetery. In 1994, Michela Rossi, inserted a map of Termini into her dissertation on the history of the Jews of Sicily, which indicates that there were once two additional Jewish cemeteries in Termini: one to the north of the town outside the Palermo Gate and the other to the south and outside the town wall near the Caccamo Gate in what became the Piazza San Antonio da Padua. 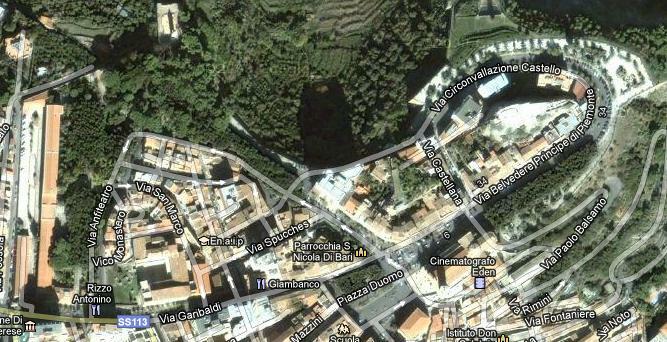 The latter cemetery was discovered during the course of work on the piazza during the early years of the 20th Century. The Jewish cemetery discovered in the Piazza di San Antonio da Padua. Stone slabs cover the graves. During the 1400s, as notarial documents clearly demonstrate, the Jews of Termini had already taken surnames. Because Jews in Europe were traditionally taxed by community, it was originally unnecessary to have the names of specific individuals for the records. But as soon as a head tax was demanded of the Jews, surnames had to be worked out. For example, a man named Brachono ben Yitzakh (Baruch son of Isaac) might take the surname Ysac or Sacco (Isaac) which now would be applied to all of his children. Another unrelated Brachono ben Yitzakh in Termini might use his profession as the surname for his family to differentiate his family from that of Brachono Sacco. Were he an artisan in iron (a blacksmith), surnames such as DiFerro or LuFerraro (both referring to iron) would be strong possibilities: he now could become Brachono LuFerraro, and if so, all of his children would take the identical surname. In the years after 1492 when these men might have made the decision to remain in Sicily and, therefore be required to convert to Catholicism, their first names, Brachono (Baruch=Blessed) could easily be changed to the Sicilian equivalent, Benedetto, when taking the sacrament of Baptism: one Brachono ben Yitzakh would become Benedetto Sacco and the other, Benedetto LuFerraro. Of course, this is only a playbook version of how given-name changes could have taken place during conversion to Catholicism; clearly it was a more complex procedure because surnames were often changed, too. In the year 1492, Ferdinand of Aragon expelled the Jews of Sicily from his island kingdom. 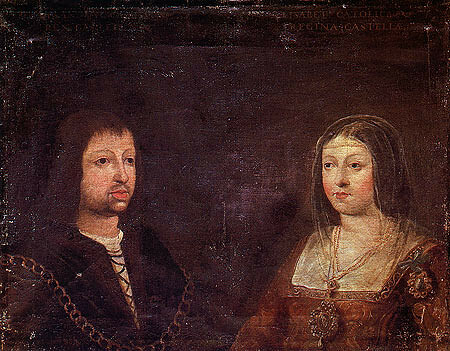 Here is pictured here with his wife, Isabella of Castile and Léon. In the same year, the Moors of Iberia were defeated and forced off of the peninsula, and Christopher Columbus was sponsored by both Ferdinand and Isabella to chart a western course around the globe in an effort to reach what is now Indonesia, the center of the spice trade. As part of their wedding agreement, Ferdinand presented Isabella with a section of eastern Sicily centered around Paternò known as the Camera Reginale. Thanks to the untiring efforts of Shlomo Simonsohn, whose monumental work dealing with the notarial documents of Sicily is now in print, it is finally possible to learn which Jewish family names in Termini Imerese and it environs remained intact after the required conversion of family members to Catholicism during the years following the extraordinary events of 1492. These surnames are presented here in both the modern spelling, and in the rather flexible 16th-century spellings found in Codex A. They were derived by comparing the family names found in the notarial documents created by the scribes working in 15th-Century Termini Imerese, with the family names in the 1542-48 Baptismal Records of Termini Imerese [Codex A] which are preserved in the San Nicola Bari Archives. 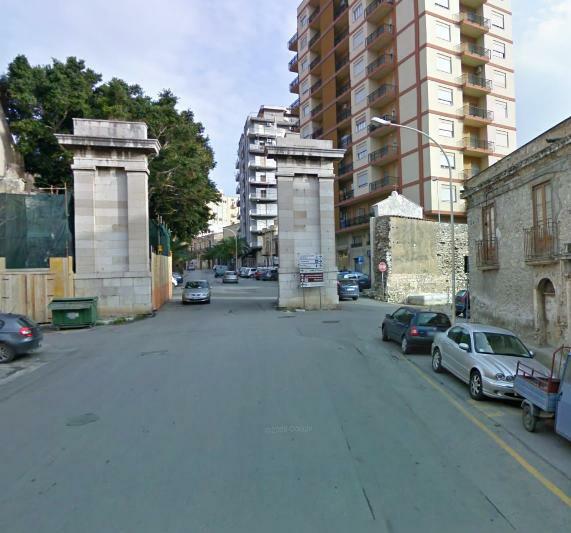 Outside the Palermo Gate: Termini Imerese. The Giudecca was inside the gate just to the left. Palermo Gate: Inside the walls. The Giudecca was on the right . The term La Giudecca was used in Southern Italy and in Sicily to identify any urban district (or a portion of a village) where Jewish communities dwelt and had their synagogues and businesses. Unlike the compulsory ghettos of Northern Italy and elsewhere, in Southern Italian hamlets and cities, Jewish families and their members voluntarily chose to live in certain areas, but were free to travel and even contribute together with their Christian neighbors to the success of the commercial, cultural, and artistic progress of the region. The majority of Giudecci included many craftsmen, doctors and tradesmen. Very few Sicilian Giudecci were unhealthy or in a state of decay. There was a communal water fountain here. Diana (Artemus) is a Greek goddess whose attributes were given over to the Virgin Mary during the developmental years of Christianity in Greece. Contrada Fiume : Brachono de Bracha owned land here 1409-1422. Contrada Fiume: Benedetto Xamar managed a small farm here 1409-1448. De li Faguacocti, a Feudal Estate in Prizzi owned by Musutu Minzi (a Jew) 1438-1468; he pastured a heard of his cows there. Shop: Iosep de Simuni managed a shop here. Royal Treasurer: Antonio Sin 1444-1476. Musutu Minzi (a Jew) acted on his behalf in Termini’s harbor. 1449 In 1475 Mardoc de Messana (a Jew) acted on Antonio’s behalf. Governor of Termini: Antonio Olzina, a knight 1439 (by 1440 he was out of office). Count Giovanni I Ventimiglia (1382–1475), eighth count of Geraci; Praetor of Palermo: 1416 and 1417, Grande Ammiraglio del Regno (Grand Admiral of the Kingdom), Viceré di Sicilia, (Viceroy of Sicily), 1430–1432, 1438. Iacu Susi 1466, 1468, 1477: salzami tax: oil, candles, sardines, tuna. Tax Farming is a technique of financial management, namely the process of commuting (its assignment by legal contract to a third party) a future uncertain revenue stream into fixed and certain periodic rents, in consideration for which commutation a discount in value received is suffered. It is most commonly used in the field of public finance where the state wishes to gain some certainty about its future taxation revenue for the purposes of medium-term budgeting of expenditure. The tax collection process requires considerable expenditure on administration and the yield is uncertain both as to amount and timing, as taxpayers delay or default on their assessed obligations, often the result of unforeseen external forces such as bad weather affecting harvests. Governments (the lessors) have thus frequently over history resorted to the services of an entrepreneurial financier (the tenant) to whom they lease or assign the right to collect and retain the whole of the tax revenue due to the state in return for his payment into the Treasury of fixed sums (rent) in exchange. 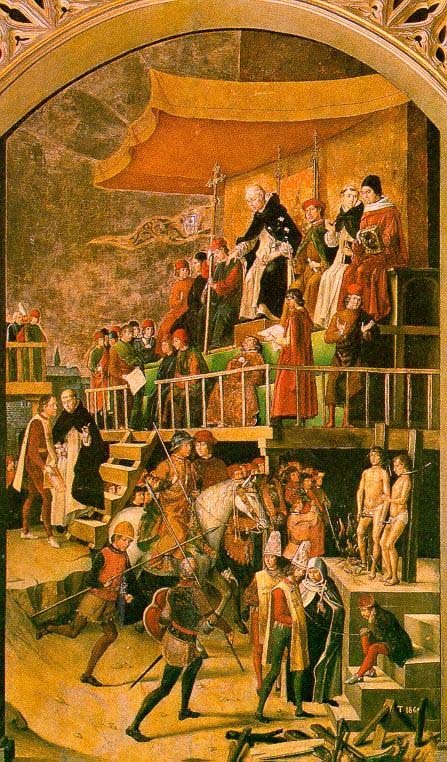 Giovanni must have been the son of a slave, because from the time of King Frederick III (1310) the children of all slaves, no matter what the religion of the parents, had to be baptized Catholic. The penalty for breaking this rule was that the infant was to be immediately set free. The first prohibition of Jews owning Christian slaves was made by Constantine I in the 4th century. Pope Gregory the Great (pope 590-604), objected to Jews owning Christian slaves, due to concerns about conversion to Judaism and the Talmud’s requirement to circumcise slaves. And it was part of St. Benedict’s rule that Christian slaves were not to serve Jews. So, in reality, Muxa Audile could have been fined for owning a Catholic slave. Sugar cane cultivation had its origins in Southwest Asia. From there it was carried to Persia and then to the eastern Mediterranean by Arab conquerors in the twelfth and thirteenth centuries. Shortly after sugar cane’s introduction to the Mediterranean, it was being grown on estates similar to the later plantations of the Americas. By the fourteenth century Cyprus became a major producer using the labour of Syrian and Arab slaves. Eventually sugar made its way to Sicily where a familiar pattern of enslaved or coerced labour, relatively large land units, and well-developed long-range commerce was established. The Portuguese and the Spanish both looked to Sicily as a model to be followed in their own colonies in the Atlantic, and in 1420 Prince Henry sent to Sicily for cane plantings and experienced sugar technicians. An innovation in sugar production, the roller mill, was introduced to the Mediterranean (perhaps by the Sicilians) and the Atlantic Islands in the fifteenth century. The roller mill reduced the time and labour needed to prepare the sugar cane, thereby increasing the mill’s capacity. It was this technology, combined with the system of production developed in the Mediterranean, which was transplanted and expanded to the Atlantic Islands. Tannery (near the water conduit; i.e probably the Cornelius Aqueduct) owned by Muxa de Panichello.He also owned a shoe shop. La Galia Sicca owned by Xibite Minzi 1472-1488; by 1449 owned by Paolo Gallo (Catholic) and partly by Muxa de Panichello. 2 Wine Presses and the land surrounding them in Caccamo: owned by Iacu Susi of Termini 1464. From the Middle Ages through the beginning of the 19th century, Termini served as a major center for the collection and shipping of grain and other foodstuffs stored and subjected to duty in a special government warehouse-complex known as the Caricatore Regio (Royal Shipper). 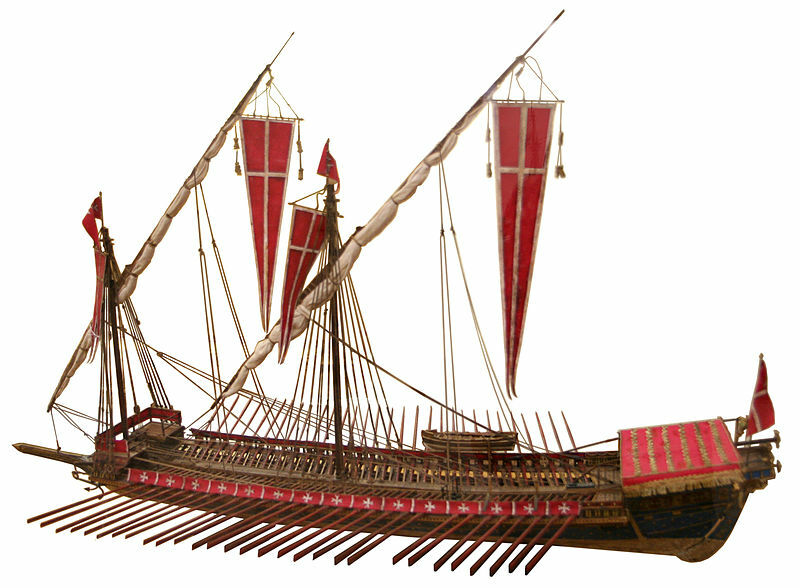 The presence of the Caricatore improved the fortunes of the city, turning it into one of the major ports of Sicily and strengthening its commercial relationships with the maritime republics of Genoa, Pisa, and Venice as well as the major Mediterranean ports of Marseille and Barcelona and, during the 16th century, those of the Atlantic. 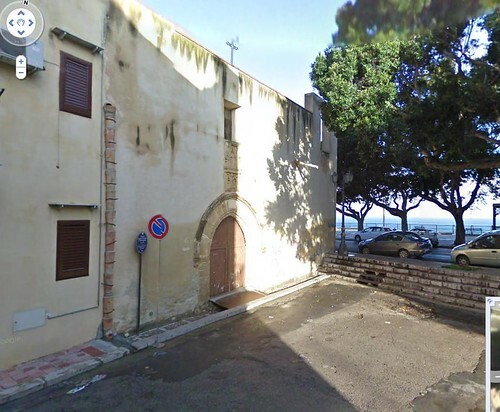 San Nicola: Archpriest: Leonardo de Ruzillono 1430: this is around the time the church was rededicated from Santa Maria ‘la Nova’ to San Nicola Bari, patron saint of sailors. San Francesco di Paola 1448-1449. The loft above the church was (rented / owned) by Xibite Maltense in 1448. 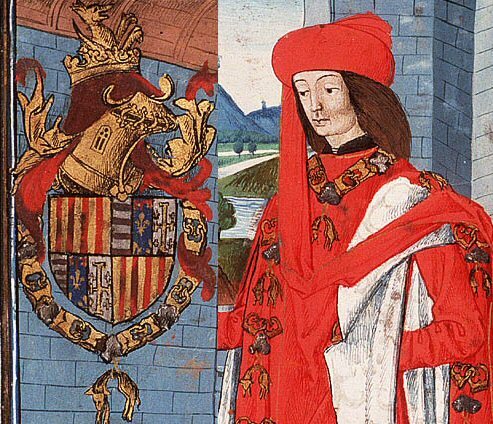 King Ferrante of Naples who welcomed the Jews of Sicily into his kingdom after Ferdinand of Aragon expelled them from Sicily in 1492. Unfortunately, Ferrante died two years later and during the interregnum the French invaded the Kingdom of Naples, forcing the Jews living there to convert to Catholicism. Some of the Sicilian Jews fled to the Ottoman Empire (especially to the town of Salonika), others converted to Catholicism and returned to Sicily. 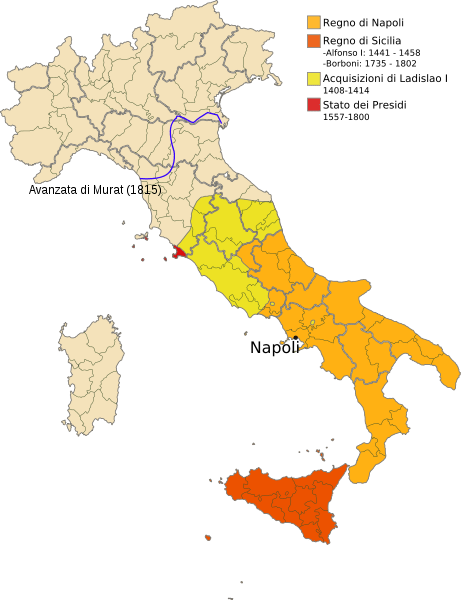 The Kingdom of Naples (orange territories). It was to here that the Jews of Sicily first fled following Ferdinand of Aragon’s Expulsion Decree of 1492. During the era of the Expulsion from Sicily, which began in late 1492, many Sicilian Jews fled to Salonika in the Ottoman Empire. 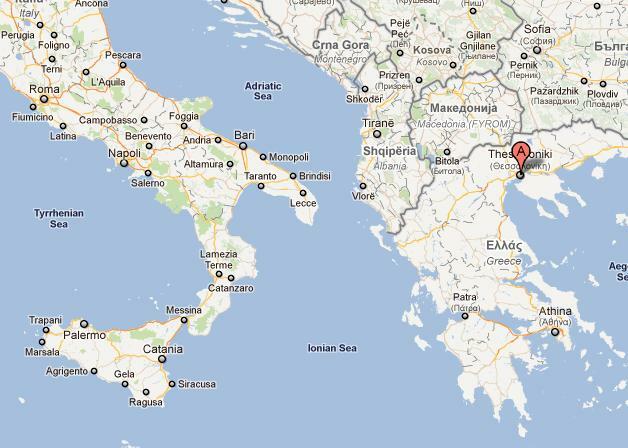 In the 1940s, the Nazis exported and murdered c. 96% of the Jews living in Salonika. The first list at the bottom of this page is an intabulation of the surnames of the Jewish Families found in the 1542-48 Baptismal Records of Termini Imerese whose forbears chose to stay in (or return to) Sicily after King Ferdinand of Aragon’s 1492 Expulsion Decree. In order to reside on the island, each family member (including all slaves: Gypsy, Slavic, Black, and Berber) had to be baptized Catholic, and every household had to hand over 45% of its holdings to the Crown. Many Jewish family members were actually baptized in the Kingdom of Naples where they had originally fled after the decree. Known as Neofiti, it is certainly possible some of these families did not intermarry with Old Catholics for quite some time. Sicilians of all backgrounds tended to intermarry with cousins for many generations, ironically, a practice similar to that followed by European royalty. This baptismal record includes the surnames of at least two children or grandchildren of Neofiti: DiNapoli and Palumbo. It reads: ‘On October 28, 1547, Father Giovanni DiNapoli baptized the son of Bartolo Giuliano DiPiroto. He was named Paulo Pietro. His godfathers are Pietro Pilato and Vincenzo Palumbo. His godmother is Sister Domenica LaGrigola.’ Indeed, the surname DiPiroto might be a Sicilian variant of the common Jewish surname, Shapiro, meaning Speyer, a town in Germany which once had a sizable Jewish community. / Photo courtesy of Father Anthony Delisi. As elsewhere in Sicily, the Neofiti went on living in Termini as before during the years following 1492, maintaining the same neighborhoods (primarily the Old Quarter near the Palermo Gate, and the Chaltigegne Quarter near the town wall at the Castello) and trying their best not to slip back into performing the rites of their former religion. The latter problem, if discovered, could lead to an appearance at an Auto de Fe in Palermo. Among the Jewish families who wanted to maintain their ancient religion, many departed Sicily for the port city of Thessaloniki (Salonika) in the Ottoman Empire where they joined hundreds of Sephardim who had left Iberia rather than convert to Catholicism. During World War II, the entirety of the huge Jewish population of Salonika (in modern Greece) was deported; a considerable number died in Auschwitz. Still other Sicilian-Jewish families who decided to leave the island kingdom after 1492, rebuilt their lives in Damascus, Syria, where they established a synagogue alongside of those of the Sephardim, and of the ancient native Jewish population. The second list below includes the names of Jewish men and women who lived in Termini Imerese during the 1400s before the Expulsion. Their names are preserved in the records kept by 15th-century notaries. The most-prominent among these Jews are marked with an asterisk [*]. Jewish family names on this second list which are also found in the 1542-48 Baptismal Records of San Nicola Bari are presented in bold lettering. 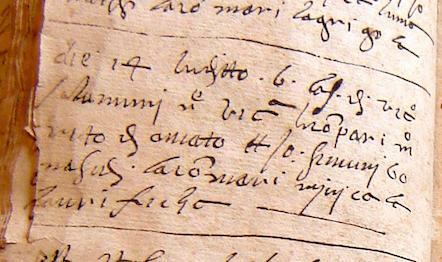 Jewish Surnames in a Baptism of 1542 in Termini Imerese (Isacco Ermanno, Cosentino, and LuSpagnolo): “The priest mentioned in the previous record baptized the son of Geronimo Isacco Ermanno. He was named Francesco. His godfathers are Antonino Cosentino and Bernardo LuSpagnolo. His godmother is Sister Philippa L’Angelica.” Photo courtesy of Father Anthony Delisi. The Neofiti of Termini Imerese lived in constant fear of being arrested by the officials of the Spanish Inquisition for backsliding into their former Jewish customs. SOURCE: Shlomo Simonsohn. The Jews in Sicily. Volume 16. Leiden: Brill, 2009.
de Tripi, Matheo [of Siracusa] 1445 NB: The de Tripi family name is found 7 times in the Termini Baptismal Records of 1542-48. Giovanni I Ventimiglia (1382–1475), eighth count of Geraci; Praetor of Palermo: 1416 and 1417, Grande Ammiraglio del Regno (Grand Admiral of the Kingdom), Viceré di Sicilia, (Viceroy of Sicily), 1430–1432, 1438. *Taguil, Brachono [of Palermo; real estate; Lieutenant of the Secreto of Termini; Procurator of the Governor of Termini, Antonio Olzina, a knight 1439; Procurator of the Secreto of Termini; part owner of tuna plants in Termini and in Cefalu`; owned wheat warehouse in port area; dealt in biscuits, i. e. hardtack; owned a male Moorish slave: Alya; owned a white slave: Sait, bought in 1436. / brother: Galluffo, an attorney 1437-1440. I came across your website and I am not surprised at the Jewish origin of my fathers family Gerace. I recently went through of Series of Genetic testing which showed that I am in Haplo Group G which has many matches of Jews who migrated from the Georgian Caucasus Region, Turkey, Iran & Iraq. Is it possible you can provide for me more information on the Geraci Jewish surname. I am planning a trip to Sicily this summer with my family? I am looking forward to continue find out more information on my ancient family. my maiden name was Lia. recently i was told that it is Jewish. is it true? and if so can you please give me some information about this surname. Infect I used to think that Lia is Italian. Do you still find this surname in your community now a days? I would love to have more information please. Ca you tell me if my name may derive from jewish roots? This is an amazing site! I can’t wait to visit here. 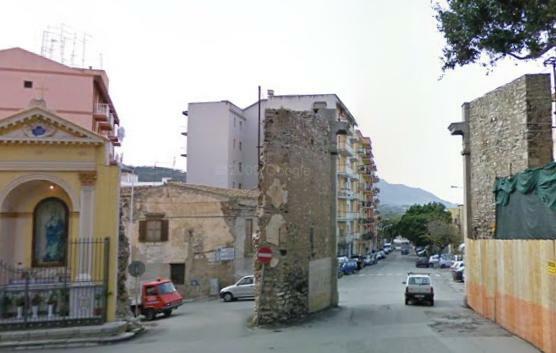 Many of our relatives still live in Termini Imerese. My father’s side of the family is from Termini Imerese, Di Cola was his last name. I was also born in Termini, I immigrated to New York at age 5. I wonder if that name has any history or if it comes from any particular heritage? My Great-great Grandmother was Santa Sarah DiCola. She married Agostino Cantanzaro. Their daughter (Maria) married Agostino Giovenco who was my Great Grandfather. The emigrated from Termini Imerese to Chicago. I’m researching information about my family. I traced back that my Great-great-great-great Grandfather Filippo DiCola married Vincenza Purpura which seems to have a Jewish connection. Hi! Wow what an awesome find, amazing job on the site. I’m astounded to see the name Sansone listed as Jewish! My great grandparents are Andrea (Andrew) Sansone and Angela Palmisano. They came to America in the early 20th century, and had 8 children. Any advice on how I might find more information about their lives and family in Termini ? Great Grandma Angela’s two brothers were supposedly in the Roman Catholic Church, one a cardinal and the other a Bushop. Any information would be greatly appreciated! Oh how fantastic!! I’m sure you’ll have a wonderful time. I hope to make it there one day myself, it’s hard to find any information here in the states. Can’t wait to hear what you find! This is a great website is very good.I have blood lines to Salmone and Sansone. I will check my ancestry on this. My family name is Sansone. Frank Sansone and parents immigrated from termini imerese in either late 1800’s or very early 1900’s and his brothers were both bishops and stayed behind. I wonder if there’s a relation to Sansone (Sansono, de Sansono, Sansuni), Sabuto [cultivated a vineyard] 1414-1421or Bernardo Sansone from mid 1500’s!! I am glad to inform you that I appreciate to read your website. I carry out researches about my family which is Salamone (nowadays Salomon) from Sicily. My ancertors left Sicily to France precisely in Ardèche. There is an interesting reference untittled Shlomoh, storia di un nome giunto en un ‘isola lontana from Pasquale Salamone. I note that the autor means cities where members of my family were born (ex: Marcols – 07). In your opinion my family was jewish? I am also looking for my Salamone roots. Have always been convinced the name had Jewish roots. I have only been able to go back to 1730 Petralia Soprana and then to Valguarnera Caropepe. showing the name Salamone. Where do I go from here? Following my anterior email I forget to tell you an important element which is that my family comes from Termini. Download the translation of the full set of 1542-48 baptismal records in PDF.